With the coldest months of the winter drawing to a close, it’s time to start thinking about the summer. And, with the summer, comes summer weddings. And, with summer weddings, comes the need to wear a suit in hot weather. For that matter, weddings aside, it’s a good idea to have a lightweight, breezy suit for wearing during the warmer months of the year — whatever your reason for wearing it might be. When it comes to lightweight, summer suits, you want to look for two main things. The first is the right fabric. The more linen, the better. Linen is super breathable, lightweight, and breezy. You’ll almost not even realize you’re wearing anything. And two, less lining in the jacket. The solid lining on the inside of a jacket definitely traps the heat around your body, and makes any jacket way less breezy. The less lining there is, the less there is blocking your body heat form escaping, and cooling you down. So, linen + less lining. That is the recipe for a great summer suit. J Crew still brands these suits as being a part of the Ludlow line. This means the usual Ludlow styling details. 2.5” lapels, which some, myself included, wish would be a bit wider. Still, 2.5” is not nearly as offensively skinny as some other suit makers, and on a taller, thinner guy like myself, it works fine. Overall, it’s pretty standard fair for a J Crew Ludlow suit. A slightly lowered button stance, a shorter-but-not-cropped bottom, double vents in the back, and slim, flat front pants. As far as the linen-cotton fabric goes, it’s absolutely awesome. The color is a vibrant lighter blue, and there is tremendous depth to it when you get up close. The full beauty of this suit is too hard to capture through a camera lens. Even J Crew’s own site does not do it justice. It’s really a beautiful, lighter blue, with a typical linen texture, and just the right amount of stiffness coming from the cotton. The color of the suit is a bit too light, and the fabric a bit too casual to wear to truly formal events, but that’s not what a summer suit is about. For an outdoor wedding, this is perfect. As a summer suit, this is perfect. The fabric and design here is stellar. Homerun in this regard to J Crew. And then, of course, there is the main event: the fact that the suit is wholly unlined. I own a half-lined linen suit from SuitSupply, but this J Crew suit is something else. There is no structure, really, to the jacket. No shoulder padding at all to speak of. Nothing in the back, top, or bottom. Only the sleeves are lined. The fabric feels almost weightless when worn, and is super comfortable. There is even a hint of stretch to it. For a summer suit, this is truly perfect . It’s hardly like wearing a suit at all. For guys that want less structure in their jackets, and prefer that look, this is a perfect way to get that. The fabric drapes well, too, which is assisted by that bit of cotton in the blend, giving it more structure. Finally, you can totally wear just the jacket or just the pants, and switch up your look that way. So, for the coming summer months, this is a well designed, unlined, super comfortable suit made out of the perfect summer fabric. That just about says it all. Check out that (lack of) lining! Beyond what we already covered, there is not too much else to say. It’s as well-made as any Ludlow suit, meaning, it’s very solid. I think the fabric is super nice, though I find that the linen in my SuitSupply all-linen suit might feel a bit nicer (though it’s 100% linen, not a blend, so it might not be a perfect comparison). There is also, as mentioned, no lining to speak of, so there is also no canvasing to speak of (which is how J Crew keeps the cost of these suits so low). In all, it feels super nice on, and is a very well-made, unlined suit. If most Ludlow suits fit you, this should fit you, with a few caveats. 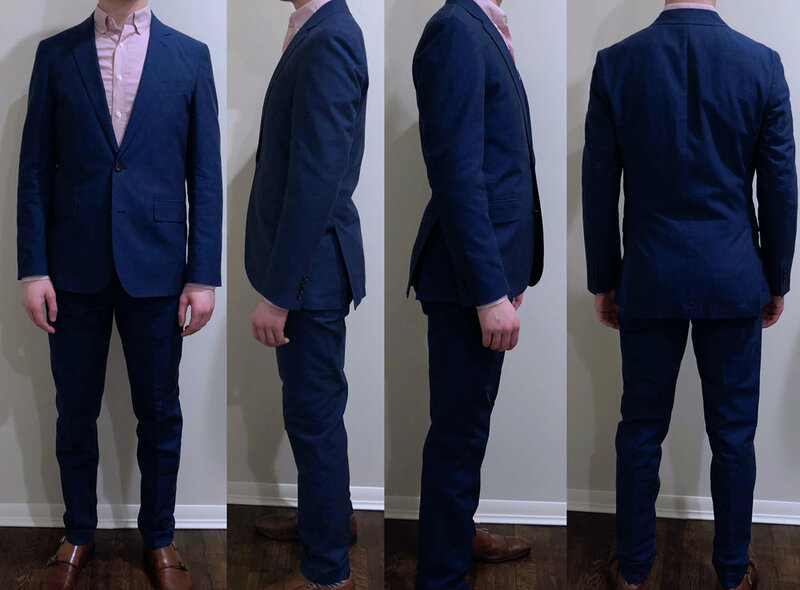 The pants are slimmer than they usually are, and the jacket is just a touch shorter (.25” shorter than my other 36 Ludlow from a year or two back), and the sleeves and waist are somewhat slimmer. It’s as if J Crew dialed in the fit on these just a tad. The pants fit me just about perfectly now, save for needing to be shortened a tad. The jackets… well, it seems I am in between sizes. The 36 this time is too tight in the waist (usually it's perfect in the waist and just needs some sleeve work), though the sleeves fit me just about perfectly. The 38 fixes the waist issue, but needs some cleaning up in the upper-back and sleeves (plus, the shoulder seems are dangerously close to passing my shoulders). The truth is, either one could be tailored to fit me really well, and there is, as you will see, just about no difference at all in length/sleeve length (which is interesting/odd, though J Crew has, as of late, been doing some weird things with their fits). Length (from top of waist) 41.00" Length 29.00" 29.25"
Leg opening 6.80" Sleeve opening 5.25" 5.50"
Thigh 10.50" Waist 17.25" 18.50"
Knee 7.75" Sleeve length 25.00" 25.00"
In conclusion, I might be between sizes on the jacket, but either one would need just a little bit of work to fit me super well. And, the pants basically just need a hem. This suit fits slim, no doubt about it. Even more slim than usual Ludlow suits, it seems. For slim guys like me, that’s awesome. I can’t think of any suit that fits this slim off the rack right now. For guys less slim, beware. This suit will run you $266. It looks good, feels good, and is the perfect summer companion. Most Ludlow suits are significantly north of $500. This is about half of that price. A 100% linen suit at Suit Supply, while maybe slightly better made with slightly better fabrics, will cost you at least $399. At $266, plus a tiny bit of tailoring, I don’t have a bad thing to say about this suit. In fact, quite the opposite. I think this is the perfect summer suit, and, at $266, likely the best summer suit that you can buy right now, and one of the best new items J Crew has put out in recent memory. Mar 18 Worth It? : Are The UNIS Gio Chinos Worth Your $200?